USGS: 10 aftershocks following 5.6 quake in Okla.
>>> here at home, folks are rattled in the heartland after a late night earthquake and a series of aftershocks that rattled a lot of homes and nerves across oklahoma . it is the latest big event in a state that has seen more than its share from mother nature this year. nbc's lilia luciano reports. >> reporter: the 5.6 earthquake struck central oklahoma at 10:53 saturday night, catching many off guard. >> all of a sudden it just shook and it just -- it was unbearable the stuff that was falling. >> reporter: the tremors left behind buckled roads, cracked buildings, and collapsed chimneys. but fortunately no injuries or deaths. hardest hit was plague, a town of just over 2,000. >> it knocked everything off the walls. >> reporter: some 25 miles away at st. gregory university in shawnee, oklahoma , students were rattled. >> everything started shaking. i was really scared. >> reporter: the university spent the day surveying the damage where a campus building, nearly a century old, partially collapsed. >> people think of st. gregory's, they think of this building. and so we need to remind ourselves of the importance of that and do everything we can to restore it. >> reporter: the earthquake was the second in less than a day after a 4.8 was recorded early saturday morning. it has been quite a year for oklahoma . in may, a series of powerful tornadoes, including an ef-5 ripped through the state, wiping out homes and killing at least eight. and a drought lasting much of the year has seriously strained the state's economy. >> oklahoma certainly has seen its share of extreme and record events. one, in fact, every season now from winter through spring, summer and now fall with this earthquake. >> reporter: for oklahomans used to natural disasters , this time cleaning up from the unexpected. lilia luciano , nbc news, atlanta. 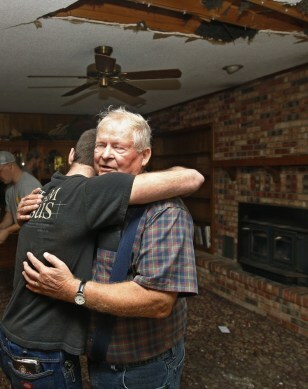 Joe Reneau, right, gets a hug from friend Cody Parsons, in his family room in Sparks, Okla., on Nov. 6. The room was damaged when the chimney collapsed during an earthquake and fell partially through the roof, at upper right. Neither Joe nor his wife, Mary, were in the room at the time, and were not injured.